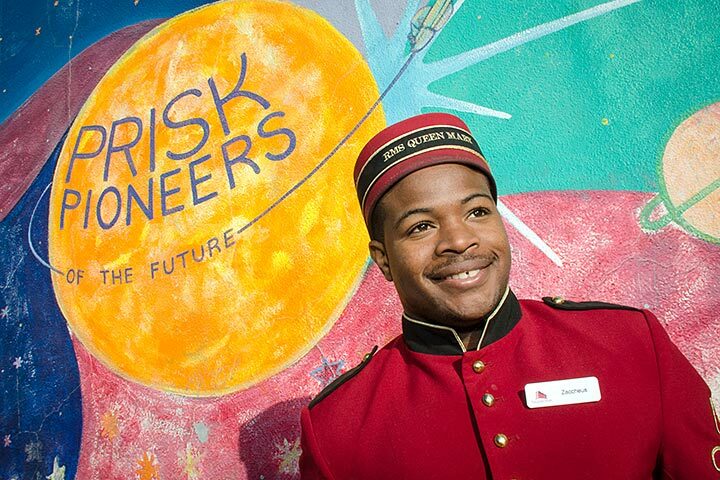 A new partnership between the Long Beach Unified School District and the Queen Mary Heritage Foundation will allow fourth graders at Prisk Elementary School to explore science, technology, engineering, arts and mathematics (STEAM) as they learn about the legendary ship. The partnership was announced during a recent ceremony at the school, where city and school officials joined fourth graders as they visited various tables staffed by Queen Mary crew members, who outlined the new curriculum to be used in the coming weeks. Students will learn how propellers and steam engines work, and how steel ships stay afloat. The course will explore navigational tools used in the past and present, and how the crew members and passengers aboard the ship communicate. The ship provides real-world examples of concepts such as transfer of energy and other science and engineering principles. Prisk teacher Joseph Sarabia created the course with Gant Elementary School teacher Kellee King and Longfellow Elementary School teacher Lisa Yarak. The aim is to expand the pilot project to grades K-5 at Prisk and throughout the school district. After several weeks of study, the Prisk students will visit the Queen Mary for an interactive experience featuring the new 4-D theater, deck, engine room, bridge and stern. The Queen Mary is one of the world’s most revered passenger liners, with the 80th anniversary of the ship’s maiden voyage approaching. The ship has served as an icon for the City of Long Beach since 1967, and its important status has linked the port and surrounding community to a global network of shipping enthusiasts, art aficionados, history buffs and those with respect for the golden age of ocean liner transport. BON VOYAGE – Queen Mary crew member Zaccheus Hankins wears the historical bellman uniform from the ship's seafaring days. The Jordan High School graduate was among Queen Mary staff to help unveil a pilot curriculum at Prisk Elementary School. Students will learn about science, technology, engineering, arts and math.